MCLEAN, Va. – Hilton (NYSE: HLT) today announced the launch of Motto by Hilton, its newest affordable lifestyle brand that will empower guests by giving them the freedom to create their own experiences in the world’s most sought-after cities. As Hilton approaches its 100th anniversary, it continues to pioneer the hospitality landscape with a new brand to address the needs and desires of the evolving global traveler. Motto by Hilton takes a fresh approach to modern travel culture. It is a micro-hotel with an urban vibe in prime global locations. Hilton evaluated the emerging lifestyle hostel model globally to understand the opportunity to enhance the shared room concept. But, extensive research showed that travelers who stay in hostels, in fact, do not like rooming with strangers and often book just with their friends or family. They want more from their hostel experience but are limited by current options in the market. Prime Locations: It’s about giving travelers access to the best location – being in the heart of the city and in the most popular neighborhoods. Right neighborhoods make a difference. Authenticity: What does it mean to be “here”? Locality breeds identity, community, and ultimately, a sense of place. Affordability: Competitive rates that open the doors to cities and locations that travelers didn’t think they could afford. Flexibility: One size doesn’t fit all — choice is paramount. Multi-purpose spaces are growing in popularity because of the flexibility they afford. Motto by Hilton hotels around the world will show off their flexibility through spaces that have been cleverly designed, technology that makes traveling seamless and a standout sleep experience that makes recharging easier than ever. Guest Rooms: With an average footprint of 163 square feet or 14 square meters, the highly efficient rooms will include space-saving features such as wall-beds, lofted beds, segmented shower and toilet stalls, and multi-functional furniture that can be discreetly stowed when not in use. 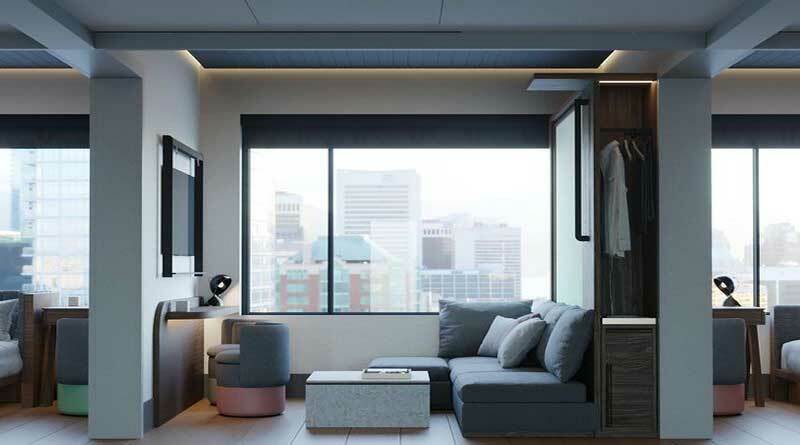 Linking Rooms: Eliminating the hassle of coordinating travel for larger groups, Motto by Hilton hotels will have the option for guests to book multiple connecting rooms in advance. Split-payments: Motto by Hilton hotels will allow guests to split payments between more than one person at the time of booking, avoiding the sometimes-complicated math exercise during checkout. Connected Room: All Motto by Hilton rooms will be outfitted with Hilton’s Connected Room technology – the first mobile-centric hotel offering that allows guests to control features in their room (i.e., temperature, lighting, TV, window coverings, etc.) from their Hilton Honors mobile app. Curated Sleep Experience: Motto by Hilton hotels will put an emphasis on a premium sleep experience. Whether it is a premium top reviewed mattress; a Sleep Kit with eye masks, essential oils or vitamin bars; a white noise app; blackout window shades; or sound absorbing materials throughout the room, Motto by Hilton is sleep-obsessed and prioritizes quality sleep for every traveler. While Motto by Hilton prices will vary by market, each property will offer competitive rates that will make it a viable option for travelers who typically stay with friends or family or seek out temporary housing options when traveling to urban markets. This global brand will be made up of a carefully curated portfolio of hotels in the most desirable urban destinations throughout Europe, the Americas, the Middle East and Asia Pacific. Motto by Hilton hotels will be located in prime neighborhoods, such as the 100-bed Motto by Hilton in Marylebone, London, which is being developed with the UK-based developer, Dominvs Group. Demolition on the site has commenced and construction will start in January 2019, targeting a 2020 opening as one of the first Motto by Hilton properties. Motto by Hilton also has deals in various stages of development in other exciting urban destinations like: Lima, Dublin, Savannah, San Diego, Boston and Washington, D.C., – to name a few. As part of Hilton, Motto by Hilton invites guests to enjoy benefits of Hilton Honors, the award-winning guest-loyalty program for Hilton’s distinct hotel brands. Members who book directly with Hilton have access to instant benefits, including a flexible payment slider that allows members to choose nearly any combination of points and money to book a stay, an exclusive member discount, free standard Wi-Fi and the Hilton Honors mobile app.